PARIS -- Citroen on Thursday unveiled the DS Inside concept car ahead of the its scheduled debut at the Geneva auto show in March. Sources told Automotive News Europe that the three-door hatchback concept is a near-production version of the planned DS3 small car, which will go on sale across Europe in early 2010. 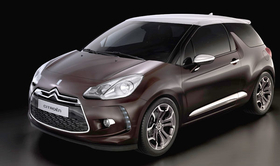 The DS3 will be the first element of Citroen's planned three-car "near-premium" range. However, the DS Inside concept bears little resemblance to the classic DS. Instead, its design, size and general feel draw immediate parallels with BMW's Mini, whose buyers Citroen executives say will be one of the principal targets for the DS3 small car. The DS3 will be built on the same platform as Citroen's existing small-segment car, the C3, as well as sister brand Peugeot's top-selling 207. The DS3 will offer higher-quality features than its cheaper cousins, as well as numerous ways to personalize the interior and exterior. This will include a popular option among Mini buyers - the choice of different paints for the body and roof. Citroen plans to launch six new models over the next three years, part of a plan to extend the French brand's profile and market share.